Sen. Barack Obama, Democratic presidential candidate, conducted a town hall meeting at Missouri S&T on Wednesday, July 30. Obama spoke to a crowd of more than 1,500 people in the Student Recreation Center about energy, the economy and foreign affairs, then opened the floor to questions from the audience. As with any outside organization, the Obama campaign paid for the use of the facility. if you ask Amanda Kamps, a junior in history at Missouri S&T. 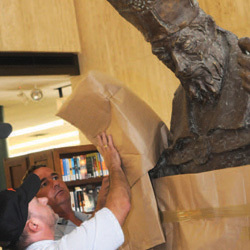 The old statue of St. Patrick that used to be in the library is gone. It has been shipped to New York, where it will be used as a mold for the creation of a new, bronzed statue. Long summer trips often take a toll on road warriors. This is especially true when the road trip in question is a 2,400-mile journey through two countries over 10 days — while going an average speed of about 45 mph. HEC Montreal ERP Simulation Game in June. In his spring commencement address May 17 at Missouri S&T, William Wulf, former president of the National Academy of Engineering, told almost 600 graduating seniors that they have a responsibility to speak out on technical issues, perhaps even run for public office. Douglas MacArthur: general, statesman, narcissist? Douglas MacArthur was involved in some of the most important military and foreign policy issues of the last century, but a Missouri S&T historian says he may be better remembered for his theatrics than his military prowess. In a new book by Russell D. Buhite, the controversial general is re-examined. 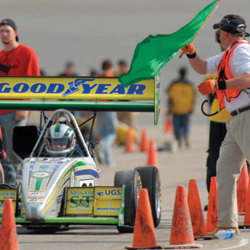 One of the most successful student design teams at Missouri S&T in 2008 was the Formula Car Team. This team, which designs and manufactures a miniature Indy-style racing car each year, finished second out of 40 teams at Virginia International Speedway (April 23-26), eighth out of more than 100 teams at Michigan International Speedway (May 15-17), and second out of 80 teams at Auto Club Speedway in Fontana, Calif. ( June 25-28).